Melodie Ulman is changing lives, one tail wag at a time. It’s 9 a.m. on a Monday morning and one of Hale Makua Health Services’ most beloved volunteers is ready to make his rounds — but only after he sniffs a few things first. Dawson, a fox red Labrador, is a regular visitor to both of Hale Makua’s facilities, where dozens of residents greet him with open arms, big smiles and, occasionally, tears of joy. As he moves from room to room, Dawson, a trained therapy animal, doles out kisses, snuggles and an endless supply of unconditional love. Sometimes the residents get a double dose of affection: Dawson’s big brother, Jaya, a 13-year-old Labrador, often accompanies him on these twice-monthly visits. “When they walk in the room, there’s a light that turns on and it warms everyone,” said Melodie Ulman, the dogs’ handler. “It’s absolutely amazing to watch.” Ulman runs Caring K9s of Maui, an all-volunteer organization that coordinates therapy-animal visits to locations islandwide. It all began in 1999, when Ulman, then a resident of Lake Tahoe, rescued Shasta, a mastiff who had a knack for making people smile. So much, in fact, that several of Ulman’s friends suggested she enroll Shasta in a therapy dog program. “I didn’t know about therapy dogs at the time,” she said. “I had to do a little research.” It didn’t take much to persuade her to give it a try. The effects of animal-assisted therapy are nothing short of extraordinary: Studies show that the human-animal bond can lower blood pressure, boost cardiovascular health, increase oxytocin (the “love hormone”) and reduce stress, anxiety and depression. 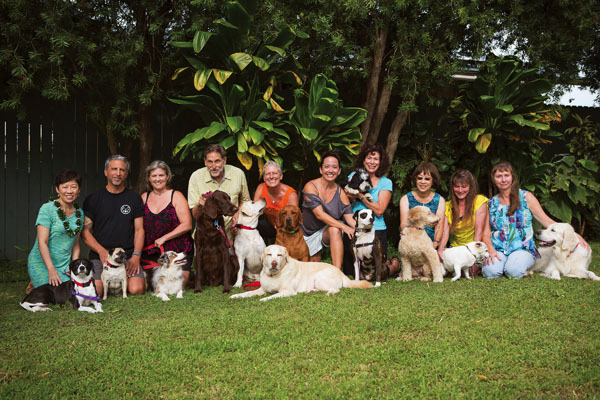 Melodie Ulman (fifth from left) and her fellow two- and four-legged volunteers bring comfort and healing to residents through Caring K9s of Maui. Ulman, who is in the process of applying for 501(c)3 nonprofit status, is a licensed therapy animal instructor and evaluator through Pet Partners, a nonprofit organization that registers therapy dogs and other therapy animal pets. 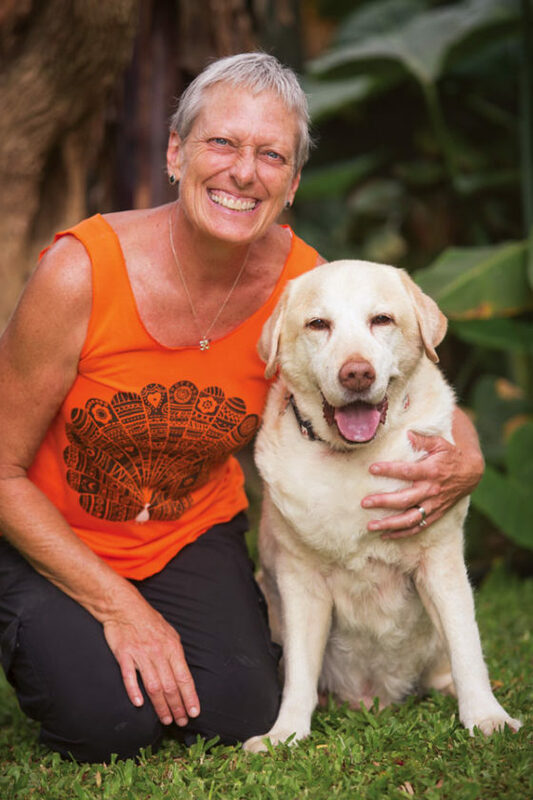 She oversees the training and evaluation of every Caring K9s of Maui dog and handler, a process that can take anywhere from a few weeks to three months. “It depends on the person and the dog,” she explained. Ulman is currently training the newest addition to her pack: a puppy named Kodi (short for “Kodiak Bear”). For more information about Caring K9s of Maui or to learn more about volunteer or donor opportunities, contact Ulman at caringk9smaui@gmail.com.